Adding certain spices to raw meat before cooking it can cut the risk of cancer which is commonly associated with meat cooked at high temperatures. Any time food is cooked, it decreases nutrients, damages enzymes and, in the case of high-temperature cooking (grilling, broiling, barbecuing and frying), it can also lead to the formation of cancer-causing substances. A study from Kansas State University found that certain spices containing natural antioxidants reduced the levels of cancer-causing substances by 40 percent when applied to meat during cooking. Three spices including rosemary, turmeric and finger root (Chinese ginger) - were found to be the most effective in preventing the formation of heterocyclic amines (HCAs). HCAs are cancer-causing compounds that are produced when meat is barbecued, grilled, broiled or fried. Consuming HCAs through meat increases risk factors for colorectal, stomach, lung, pancreatic, mammary and prostate cancers. "Cooked beef patties appear to be the cooked meat with the highest mutagenic activity and may be the most important source of HCAs in the human diet." The research team investigated six spices - cumin, coriander seeds, galangal, fingerroot, rosemary and tumeric -- and found that the latter three had the highest levels of antioxidant activity toward inhibiting the formation of HCAs, with rosemary as the most effective. Previous studies have shown that meat products cooked below 352 degrees Fahrenheit for less than four minutes had low or undetectable levels of HCAs, with HCAs increasing with higher temperatures and added cooking time. However, it's not a good idea to lower cooking temperatures too much because the meat will not be cooked thoroughly. Therefore antioxidant spices with phenolic compounds can block HCAs before they form during heating, whilst still allowing high temperatures to be maintained. Spices are not only beneficial for reducing levels of HCAs. They can also help cut back on polycyclic aromatic hydrocarbons (PAHs), which are cancer-causing compounds formed in the smoke that surrounds food during grilling, and advanced glycation end products, or AGEs, which are also formed during high temperature cooking. AGEs build up in the body over time leading to oxidative stress, inflammation and an increased risk of heart disease, diabetes and kidney disease. A previous study found that adding a spice blend to burgers could reduce the level of malondialdehyde, a chemical marker for oxidation, in the meat by 71 percent and levels in participants' urine by 49 percent. This benefit likely comes from spices' potent antioxidant content. On a per gram fresh weight basis, oregano and other herbs rank even higher in antioxidant activity than fruits and vegetables. In the above study, researchers used a blend of cloves, cinnamon, oregano, rosemary, ginger, black pepper, paprika and garlic powder. 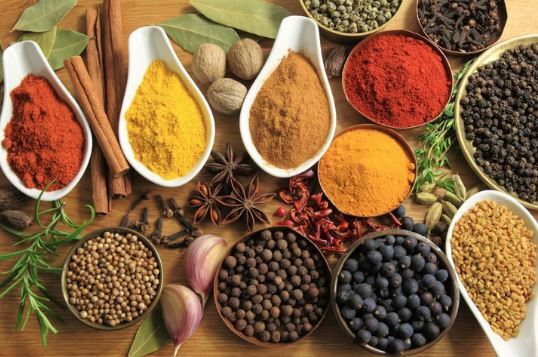 Spices are a great way to naturally make food healthier and tastier. To cut down on your exposure to cancer-causing substances that are formed during the cooking process, marinade meat that is to be grilled or barbequed in your favorite herbs and spices for at least a few hours. Cook meat partially before putting it on the grill, or cook smaller pieces of meat, which take less time to cook, and therefore allow less time for these substances to form. Avoid over-cooking meat. In terms of HCAs, the worst part of the meat is the blackened section, so avoid charring your meat, and never eat the blackened sections. Reduce the amount of AGEs in your food by using an acidic marinade that contai ns lemon juice or vinegar. Turn the meat often, as this will help cut down on harmful chemicals from forming. Puangsombat K, Smith JS. Inhibition of Heterocyclic Amine Formation in Beef Patties by Ethanolic Extracts of rosemary. Journal of Food Science Vol 75: 2, P T40 - T47. Li Z, Henning SM, Zhang Y, et al. Antioxidant-rich spice added to hamburger meat during cooking results in reduced meat, plasma, and urine malondialdehyde concentrations. Am J Clin Nutr (April 8, 2010).